I’m referring, of course, to yet another problem with EME history, the challenge of determining the date on which any given event occurred. It’s not just a matter of too few sources, or of sources that are too vague or don’t include the information you want. No, it’s much more fundamental than that, for it has to do with how early moderns talked about time itself. The measurement of time, like a host of other standards such as distance and weight, is dictated by cultural assumptions that vary over time and space, and those variations tell us things about the cultures in which they were created. The political/religious underpinnings of such calendar systems, for example, serve as perfect examples of revolutionary movements’ all-encompassing world-views, as does the choice between B.C./A.D. and B.C.E/B.C. So as we shift from one calendar year to the next, we should be mindful yet again of how confused our early moderns were. And there are plenty of things to be confused about, mostly revolving around the degree of precision used in talking about time and the variety of measuring systems to choose from. For dates specifically, these include things like when to start a year, whether to measure the year by the sun or moon (and the related issue of exactly how many days to include in a year), what number to give a year, whether to use relative vs. absolute references to other dates (I knew those Excel spreadsheet tutorials would come in handy), and even whether to commemorate an event’s anniversary on either the date or day of the week it happened on. Over the next several centuries the rest of Europe would slowly come over to the inevitable logic of the Vatican astronomers and mathematicians, but misgivings took awhile to assuage, as the graphic below indicates. Before the 19C then, political and religious factors limited the spread of the Gregorian calendar reform, so there was inevitably confusion when crossing these calendrical borders, as a campaigning general might when writing in a N.S. land to his home government in an O.S. domain. Thus in contemporary correspondence you will sometimes see dates written as March 4/15 – i.e. March 4 in the Old Julian calendar but that same day is March 15 in the newer Gregorian style. Any early modern historian worth their salt will specify somewhere in their writings whether they use Old or New style, and how they will identify them, usually as O.S. or N.S. They might even be kind enough to note when an Englishman, say the Duke of Marlborough, stopped using the Old Style (i.e. English) calendar in his letters from Flanders (i.e. a New Style territory), and switched to Gregorian. Useful to know. Unfortunately, however, modern historians of early modern England often continue to use OS in their works. It makes sense when faced with converting all of their dates to NS (which then don’t match up with document dates), but it makes it much harder for any kind of comparative history. [As an aside, in my Notes database I record the date of the letter as written, but also include a field that automatically converts all dates to a standard NS – this requires making them a date field in order to deal with shifts from late in one month to early in the next. Before 1700 the difference was 10 days, but from 1700 onwards another day of error had accumulated, so you have to add 11 days to convert from OS to NS in the 18C.] This is also why you always need to be extra careful when talking about English military events pre-1752, particularly events taking place wholly in England, such as battles during the English Civil Wars. For my This Day in EMEMH posts I try to always use the New Style date, even for English events. But I don’t know if there’s a standard method to determine on which date to celebrate events that occurred before the NS switch – does one celebrate Blenheim on 2 August or 13 August? But of course it’s much more complicated than just OS vs NS, because as soon as you try to create a narrative by placing a letter within a broader chronological context, you have all sorts of dates to contend with: the date an event happened, the date a letter mentioning the event was written, the date that letter was sent (could be days later), the date that letter was received, the date that letter was ‘processed’ or otherwise logged in to the ‘system’ (if you’re lucky the receiving clerk will make an annotation on each letter noting when the document was received), the date that letter was read for the first time and (maybe) acted upon, the date(s) that letter was passed around/summarized in a council meeting, excerpted or otherwise distributed to a broader audience, etc. And that’s on top of other issues that we’ve mentioned before, such as the dating of different stages of a siege. If you’re trying to figure out not just the date a document was written, but when exactly events within that document took place, you have to remember that events mentioned in a letter might have happened days or weeks before the document was written. If the letter does provide an indication of the day of the week (not the date) on which an earlier event took place, you should consult your handy universal calendar. If a letter says something happened last Tuesday, and you know the letter was written on 20 March 1702 NS then you need to know what day of the week 20 March NS was. Sometimes the letter’s endorsement will include a day of the week, but often not. In that case, you can check the universal calendar to see what day of the week March 20 fell on in 1702. Then you can count back to figure out the date for the previous Tuesday (see the rather cryptic Playford version on p. 8 in the image below). Once we have the days figured out, we still can’t move on to the years quite yet, because occasionally the months get in the way as well, particularly the early moderns’ use of tricky abbreviations. Sometimes you’ll see a letter dated “3 9re 1634”, or “9bre”, maybe even “3 IXre 1634”. But it’s not really 3 September 1634 (i.e. the ninth month of the year). No, that would be too easy for us moderns. If you know anything about early modern paleography (study of handwriting), you know to pay close attention to those little squiggles that are actually abbreviations (-re, ~, etc.). If you know a Romance language (especially Latin) and sound that “9re” out, you realize that in fact “9re” is an abbreviation for the Latin-based novem-bre and has nothing to do with the month’s number in the calendar year, which might be a modern’s first guess. So really the date is 3 November 1634, since November was the ninth month of the Roman calendar (hence the novem-), but they kept the name derived from the Latin word for the number nine even after they added additional months in front of it. And of course early modern letter writers only used that type of abbreviation for the last half of the year, since only those months have names based off of numbers. Just so we’re clear: 7re is the ninth month of Sept-ember, not the seventh month of July; 8re is the tenth month of Oct-ober, not the eighth month of August; 9re is the eleventh month of Novem-ber, not the ninth month of September; 10re is the twelfth month of Dec-ember, not the tenth month of October. There are no 1re-6re or 11re-12re months, and January-August do not have equivalent abbreviations. Our early early moderns liked their Latin, as we can also see by the tendency to use Roman numerals well into the 17C. Having dealt with days and months, we can finally get back to the originating point of this post: years. Here too, the problem is that there are multiple ways to measure years, and this means, practically, that it’s not obvious when to start a new year. But as with everything else early modern, the complicated exceptions regarding years occur for yet a different reason than our problems with days and months. This annual complication is different from the day’s problems with OS-NS, or the ordinal-vs.-etymological confusion regarding months. The problem with years comes from the fact that January 1 wasn’t even the beginning of the new year in many contexts, that there were a whole other set of calendars with which to count years. This is actually the problem most familiar to us today: the calendar year may run from January to December, but academics have their own calendar year (September-June) and businesses have yet another year for their own purposes, the fiscal year (often running October-September). So too did early moderns have different ways of denoting the start of the new year. 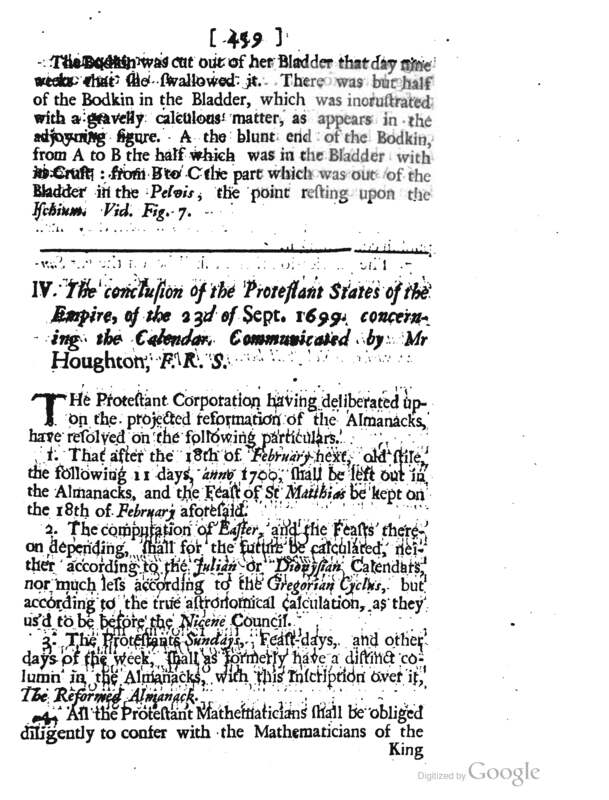 There was the calendar year of January-December, which, as everyone knows, begins on the first day of January with a celebration of the circumcision of Jesus (see Playford’s table below). To cut a long story short, William the Conqueror dictated that England celebrate the New Year on Jan 1, because if there’s such a thing as a new beginning, or at least an end to the old, I’d think circumcision would have to be it. William clearly fore-saw the way of the future. 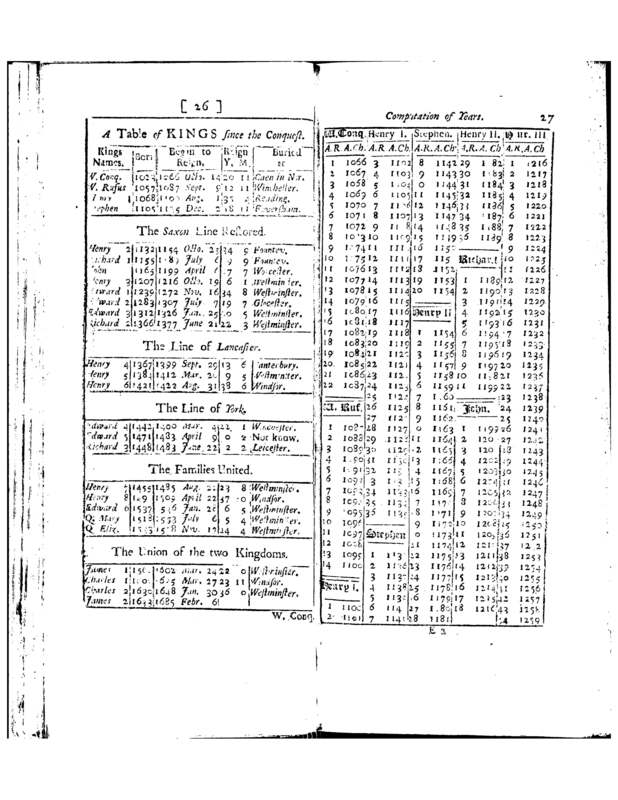 As a result, you might even see sources that deal with both OS/NS and calendar/civil calendars by writing their dates thus: 7/18 February 1707/8. That is to say, the day is 7 Feb 1707 in the OS civil calendar, 7 Feb 1708 in the OS calendar calendar, 18 Feb 1707 in the NS civil calendar, and 18 Feb 1708 in the NS calendar calendar. Same day, different names. If we extend our gaze back further, it gets even more complicated. The further back in time you go, the less likely they were to use the Christian calendar (i.e. A.D. years), and the more likely they were to use other, more relative and less precise measures. 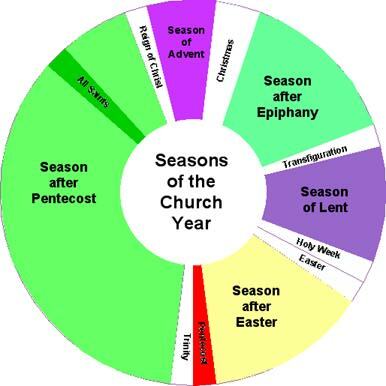 In addition to the agricultural rhythms enforced by the seasons, the most prevalent way of dividing up the year was the Christian liturgical calendar, using religiously-significant events as benchmarks. 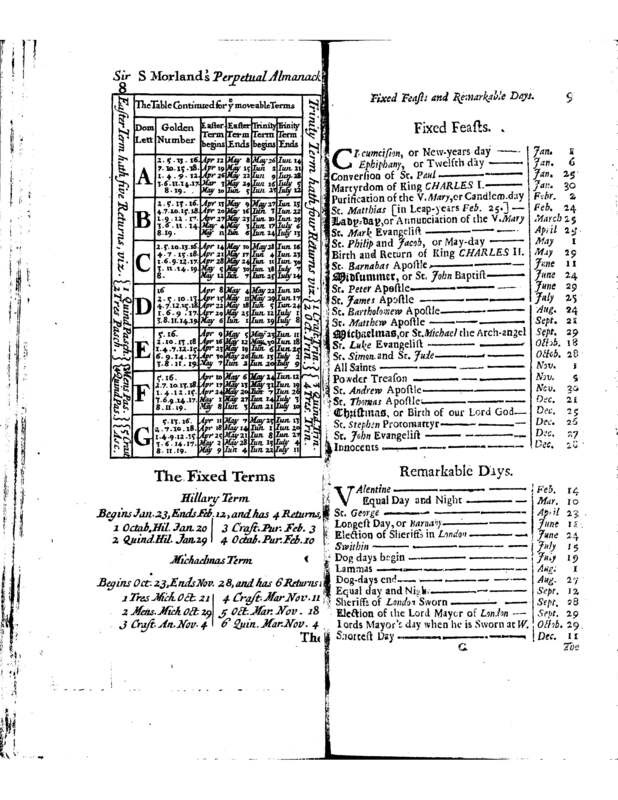 Christmas is one of the few fixed dates on this calendar, which is why the Church was sure to include the necessary navigational aids in their liturgies, while printed almanacs (explicitly mentioned in several of our excerpts) allowed contemporaries to keep track of all these exception-ridden details. Politically, there were regnal years. Regnal years follow the older tradition of starting the numbering of years from the date at which the new monarch came to the throne. Inconveniently for us historians, most monarchs didn’t even have the common decency to wait until December 31 to die, so not only do the years start over at one, but they almost never correspond with calendar years: the 1st regnal year of Henry VIII began on 22 April 1509, while his 2nd regnal year began on 22 April 1510. Fortunately, Playford included this useful table to help his contemporaries (and us) out. These regnal years are useful for later EMEMHians, particularly if you are looking at chronicles/histories of earlier English history, or legal documents or collections of royal proclamations and laws. For example, the Magna Carta was issued in 9 H. 3, or the 9th regnal year of Henry III’s reign, or in July of 1215. They continued this dating convention for legal documents into the 18C, and 18C legal compilations will often list laws by their regnal years, even those from the early 18C. Here is a useful website to calculate for English monarchs. As if that weren’t enough, I haven’t even mentioned those decimal-crazy French Revolutionaries, with their (retroactive) Year I, followed by Years II and III (l’an I, II, III…), their 10-month years, their 10-day long décades (replacements for weeks), not to mention their decimal clocks: 10 decimal hours in a day, 10 decimal minutes in an hour, 10 decimal seconds in a minute! Repeat after me: standardization is a necessary evil. Playford, John. Vade mecum: or, The necessary companion Containing, 1. Sir S. Morland’s Perpetual almanack, … curiously graved in copper; with many useful tables proper thereto. 2. The years of each king’s reign from the Norman conquest compar’d with the years of Christ. 3. Directions for every month in the year, what is to be done in the orchard, kitchin, and flower-gardens. 4. The reduction of weights, measures, and coins, wherein is a table of the assize of bread. 5. A table wherein any number of farthings, half-pence, pence, or shillings, are ready cast up; … 6. The interest and rebate of money; the forebearance, discompt, and purchase of annuities. 7. The rates of post-letters, both inland and outland. 8. An account of the penny-post. 9. The principal roads of England, … also the market-towns, on each road, with the days of the week the markets are kept on; … 10. The names of the counties, cities, and borough-towns in England and Wales, … 11. The usual and authorized rates or fares of coachmen, carmen, and watermen. London: printed by A.G. for Tho. Sawbridge at the Sign of the three Flower-de-Luces in Little-Britain, 1687. Chamberlayne, John. Magnae Britanniae Notitia: Or, The Present State of Great-Britain, with divers Remarks upon The Antient State thereof. London: Printed for Timothy Goodwin, 1710. 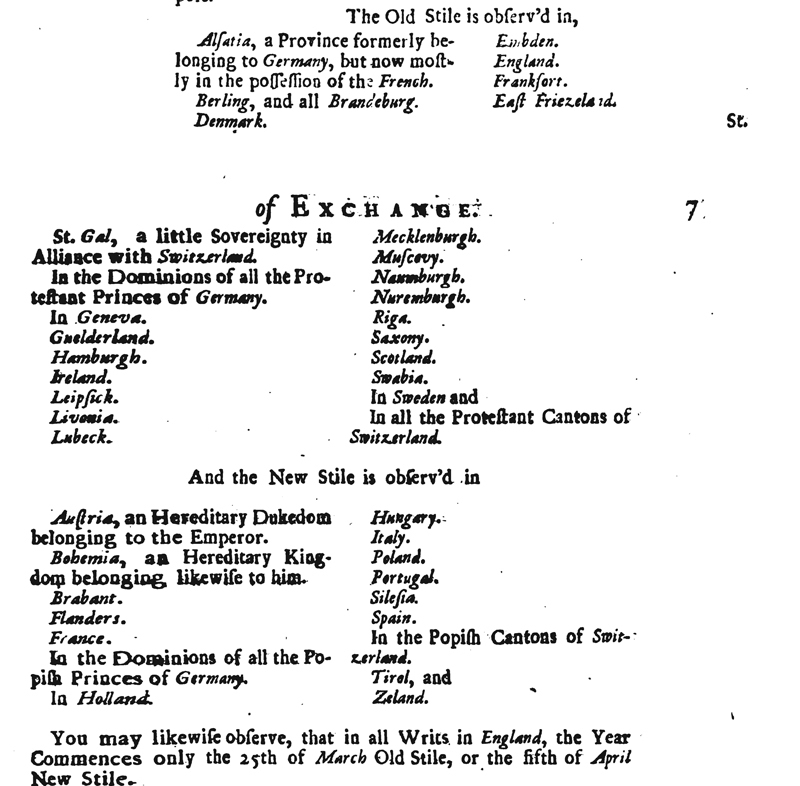 There were many editions of this reference work published throughout the 17-18C. Hodgson, James. An introduction to chronology containing an account of time; also of the most remarkable cycles, epoch’s, era’s, periods, and moveable feasts. To which is added, a brief account of the several methods proposed for the alteration of the style, the reforming the calendar. London: printed for J. Hinton, 1747. Benedict, Philip. “Divided Memories? Historical Calendars, Commemorative Processions and the Recollection of the Wars of Religion during the Ancien Régime.” French History 22, no. 4 (2008): 381-405. Describes how partisans perpetuated the disputes of the French Wars of Religion using calendar festivals. Playford’s festival list above shows that politics were frequently connected with politics – just try to drink a cup to the deposed King James II on his birthday! Poole, Robert. “‘Give us our eleven days!’: Calendar reform in eighteenth-century England.” Past and Present 149, no. 1 (1995): 95-139. 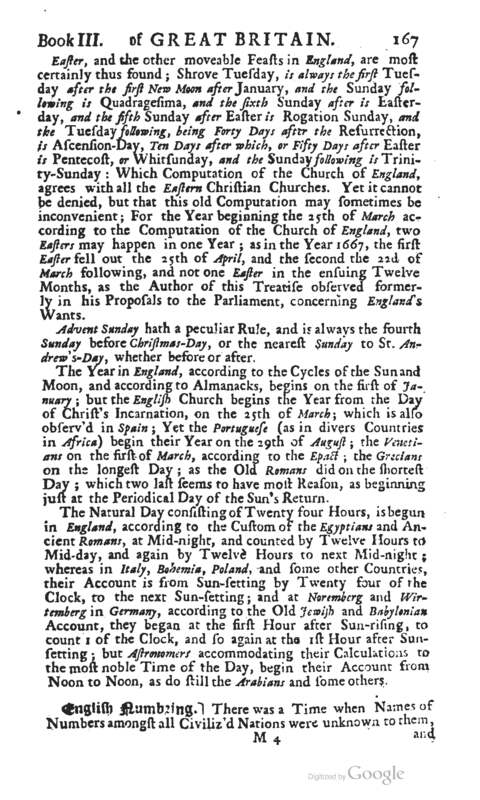 Discusses the social and cultural importance of calendars in 18C England. There are undoubtedly many other works on the subject, but I haven’t done a search other than the occasional reference I’ve come across while looking for other things. P.S. Turns out Samoa is doing their own version: MSNBC story.